Is it Web 3.0 yet? Do not know what Web 3.0 is exactly? Well, this article is a gentle introduction into the future of the web that is being discussed by some but never has been exposed to the greater public. Get ready to learn something completely new which will become dominant on the web in the next several years. The Web we know now, which loads into a browser window in essentially static screenfulls, is only an embryo of the Web to come. The first glimmerings of Web 2.0 are beginning to appear, and we are just starting to see how that embryo might develop. The Web will be understood not as screenfulls of text and graphics but as a transport mechanism, the ether through which interactivity happens. It will still appear on your computer screen, transformed by the video and other dynamic media made possible by the speedy connection technologies now coming down the pike. It will also appear, in different guises, on your TV set (interactive content woven seamlessly into programming and commercials), your car dashboard (maps, yellow pages, and other traveler info), your cell phone (news, stock quotes, flight info), hand-held game machines (linking players with competitors over the Net), maybe even your microwave oven. Web 2.0 sites allow users to not only retrieve information, but to also run applications directly through a browser. All the data that users own can be shared, rated, and embedded by others. Participation became a very important part of the Web 2.0 experience, in contrast to Web 1.0. The way information is saved on servers and in databases did not really change. Relational databases still hold most of the data that is shown to users. These databases are usually related to some particular service and are stored and shared within one organization. Tag clouds are one of the signature features of Web 2.0. 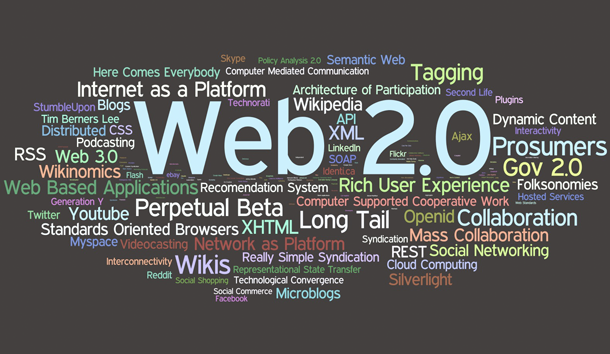 This particular one represents concepts and technologies that are related to Web 2.0 itself. Web 3.0 changes all of this by completely disrupting the technology and economics of the traditional software industry. The new rallying cry of Web 3.0 is that anyone can innovate, anywhere. Code is written, collaborated on, debugged, tested, deployed, and run in the cloud. When innovation is untethered from the time and capital constraints of infrastructure, it can truly flourish. This is a bold statement simply because it describes an entirely new concept that was not even possible to discuss until now. The whole point of Web 3.0 is to make information accessible to people and computers at any time from any location. That’s why cloud computing seems to be such a great idea. If one computer or server breaks it doesn’t mean that the entire system goes down, it only means that a small piece of it doesn’t work, which is not harmful to the system as a whole. Users would still be able to access information and change it. 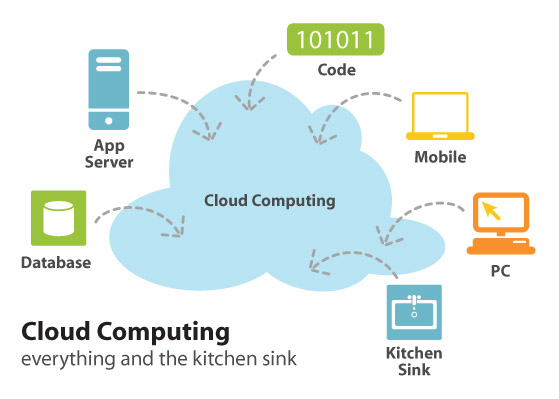 This popular diagram shows the main idea behind cloud computing—all devices get hooked up to the cloud, which has needed information and services. Any application needs a model of computation, a model of storage, and a model of communication. The statistical multiplexing necessary to achieve elasticity and the illusion of in?nite capacity requires each of these resources to be virtualized to hide the implementation of how they are multiplexed and shared. Our view is that different utility computing offerings will be distinguished based on the level of abstraction presented to the programmer and the level of management of the resources. After this quick insight into the technological bases for Web 3.0, let’s look at different ways information can be presented to both humans and computers. This is a crucial part of the semantic web. To represent information on the web, html is widely used. However, it does have some limitations. html is not able to semantically connect pieces of information within itself. For example, one may create a list of employees on a webpage. The html of this page can make simple, document-level assertions like “This is a list of employees.” There isn’t any capability within the actual code, however, to assert unambiguously that employee with the id “2335” works in the sales department. Therefore there is no way to add connections between pieces of information that are present on a page. A solution to this problem within html is to add semantic value to html elements, which is currently being implemented in the latest (fifth) version of html. For example, using an tag denotes “emphasis” in places where it’s needed (this works in all versions of html). Another way is to use microformats, which are unofficial attempts to extend html syntax by adding specific classes and relative attributes to html elements. Microformats create machine-readable semantic markup about objects like persons, events, or feeds of information. In Web 3.0, adding semantic value to elements and using microformats is extended further. It involves publishing information specifically designed for data. Examples of such languages are Resource Description Framework (rdf), Web Ontology Language, and xml. These new descriptive languages can describe arbitrary things like events, structures, and news. They also allow interlinked connections to be created between all sorts of data, which helps aggregators and crawlers to navigate in the huge information graph which represents the Internet. The content is displayed as descriptive data and is stored in relational databases that use cloud computing. Twitter is a social micro-blogging service that enables users to send and read short messages. It began as a service for groups of friends and relatives to “follow” each other and share what happened to them during the day. Now it has grown into something much bigger, and is called the bridge to Web 3.0 by some. When people use Twitter today, they don’t necessarily follow their friends or relatives. Instead, they follow people anywhere in the world that share the same ideas or interests. People posting about similar things can easily be found by using tags on information. If somebody is interested in dogs, she can search for information tagged as #dogs and find current, active discussions about dogs on Twitter in real time. The simple model suggested by Twitter reflects the fact that describing separate small chunks of information by tagging works well. People can easily manage it, as well as computers that crawl and syndicate text information. This principle can readily be applied to other types of information such as videos, images, people’s profiles, articles, and news. The beauty of Twitter is in its coherent api that can be accessed via xml—one of the descriptive languages that represents information semantically. Simply speaking, it is a set of rules for encoding information electronically. There are a variety of programming interfaces which developers can use to access xml data from Twitter and make it acceptable in any software product, web service, or site. 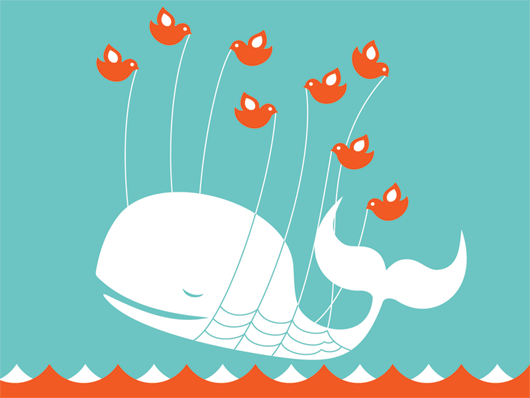 When Twitter experiences an outage, users see the “fail whale” error message image, created by Yiying Lu. It has become iconic and adored by Twitter users. The recent hacking of a Twitter employee’s personal e-mail account is raising questions about the security of storing personal information and business data on the Internet. The Web has been buzzing since a hacker allegedly broke into a Twitter administrator’s personal e-mail account about a month ago and used that information to access the employee’s Google Apps account.… The hacker sent 310 documents to the tech site, according to a post by Michael Arrington, TechCrunch’s founder and co-editor.… In what appears to be a separate incident, a hacker broke into Twitter chief executive Evan Williams’ wife’s e-mail account and then accessed Williams’ PayPal and Amazon accounts, Twitter says.… It’s unclear what if any impact the incidents will have on the future of cloud computing, the idea that documents and computing power can be stored “in the cloud” of the Internet rather than on desktops or laptops. Web 3.0 assumes that computers will be using their own reasoning to deal with tons of information, available in forms like rdf, xml, or any other markup language. To catalog information in real time and deal with its vagueness, systems will have to use fuzzy logic in order to process different types of information. Uncertainty and inconsistency are the two other big challenges that developers of Web 3.0 face. Uncertainty refers to something a system can’t easily classify and save to the appropriate table in the database. Inconsistency stands for logical contradictions which inevitably arise during the development of large systems. One can’t use deductive reasoning to solve this problem. Instead, defeasible reasoning and paraconsistent reasoning should be used. Defeasible reasoning is a kind of non-demonstrative reasoning, where the actual reasoning does not produce a full or final demonstration of the relation between semantic elements. Paraconsistent reasoning involves contradictions that may arise in a discriminating way, which provides a simple and intuitive formal account of truth in semantics. Other problems associated with Web 3.0 expansion are the vastness of the web and security issues with cloud computing. 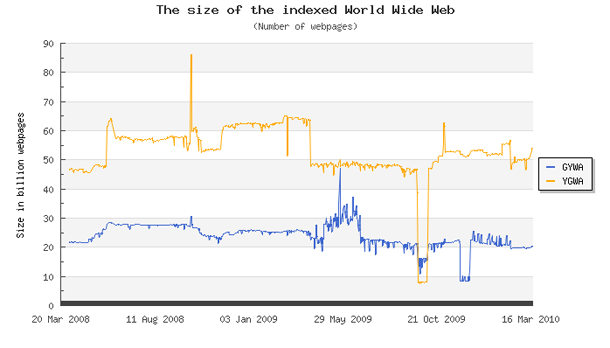 According to WorldWideWebSize.com, the web today contains at least 20 billion indexed pages. This is a rather big input for any modern system that deals with information and semantics. It will take some time to remove all duplicate terms and to outline information with semantic values that are specific to the subject. GYWA results are being sorted by Google, Yahoo!, Bing, and Ask and ygwa results by Yahoo!, Google, Bing and Ask. This means that Google has most of the indexed pages on its servers. Finally, cloud computing raises questions about privacy, security, and reliability—a major subject of discussion at a workshop held last January at the Center for Information Technology Policy at Princeton University. Allowing a third-party service to take custody of personal documents raises awkward questions about control and ownership: If you move to a competing service provider, can you take your data with you? Could you lose access to your documents if you fail to pay your bill? Do you have the power to expunge documents that are no longer wanted? Developers have been trying to solve security issues for a while. Today, we can tell that some were successfully resolved. Many of the big players in the computer world today such as Google, Mozilla, and Microsoft have started using and promoting cloud computing as a service that everybody can use. The Web 2.0 to Web 3.0 migration has had a successful start; now users and businesses can consider it as a serious platform for creating and publishing information. A number of apis have been developed for laying out information semantically, so that information that is stored in relational databases can be adequately processed by both humans and computers. As a technological basis, cloud computing will be used intensively, so that resources will not need to be stored on one server that can in theory go down any time. There are still quite a few challenges that Web 3.0 developers are faced with, yet they are being resolved slowly but surely. Twitter has set a successful example already by combining the latest information on the web into a real-time feed of tweets. The future of the web is Web 3.0. This will eventually lead to tagging all online information, creating links between related pieces that will be fully understood by humans and computers.